So, Bangkok a second time round. Had I not needed a passport to the leave the country, I wouldn't have felt the need to go back to Bangkok but, once again, having my passport stolen proved to be a blessing in disguise. A lot of things wouldn't have happened had that handsy little Thai not helped themselves to my wallet - I would have gone back to Aus, to New Zealand, to LA and probably had a much longer journal. However the experiences I had in Thailand were priceless and in a funny way, worth the stress of being robbed. Odd. My five days in Bangkok went by in a daze. They involved a lot of phone calls to the embassy, a little crying and frustration and a lot of walking - the cheapest thing to do. I don't want to dwell on how useless the British Embassy in Bangkok is but suffice it to say I hope I never have to deal with that level of incompetence again. I wouldn't want to hit an unsuspecting desk clerk. It took two days of calling and waiting before I decided to make my way to the embassy with new passport photos, a wad of money and ready to buy an emergency travel document. Luckily it turned out that it had been waiting at the post office for a few days. Of course it was. It would be silly to expect the postman to deliver something which was in the post office. OBVIOUSLY it was something that had to be found and collected. Clearly. Once a lovely Embassy lady got on her bike, found said parcel and brought it back I can't describe the relief that came over me! I was British again! I could go home! To celebrate I took my new passport to Jim Thompson's house. I had been reading a book all about Jim for the last few weeks so I thought it only fitting to see the house itself and to make the most of being in Bangkok, now that I knew I was definitely leaving. The house was incredible. Better than I could have imagined. I suppose I was both awestruck and disappointed by it. 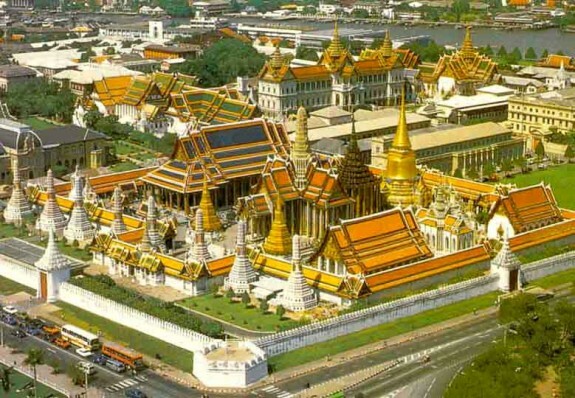 I have come to understand that once all of Bangkok was that beautiful and ornate and it was soon overtaken by high rise buildings, busy motorways and even the canals were filled in for more space. Although Bangkok is not the busiest and most industrial place I have ever visited, I can imagine it once was incredible and it is so disappointing that tourism has made it what it is today. At least Jim's house is still standing proud. Definitely a highlight of the trip. My last few days in Bangkok were busy. I now had money to burn and not a lot of time to do it so I hit the tourist attractions HARD. National Gallery, National Museum, The Grand Palace, Wat Pho, Khao San Road (where a cheeky tuk tuk driver tried to drop me off in the middle of a random lane - luckily I know Bangkok like the back of my hand now and I wasn't going to be had). The Museums were good, but not worth going into detail about. Worth a visit but didn't really spend too long there. The Grand Palace was brilliant. Even though Poppy and I had attempted entering it a few weeks before and gave up, I am very glad I finally managed to get in. It is... very... gold. A lot of gold and red. It is also heaving with tourists, but if you find a quite little corner in the shade the sun bouncing of the gold soon blocks out the tourists and you seriously feel as though you are sitting in the sun itself. The emerald Buddha was also stunning. I could have sat there staring at it for hours. 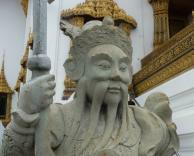 Wat Pho was great. It was a fleeting visit as all it really is, is a huge golden lying Buddha surrounded by cameras and foreigners but it is pretty impressive to say the least. The name is rather deceiving... if you don't pronounce it right. And then, that was that. The End. A shorter trip than planned and before I knew it I was on a plane home ready to surprise Mum on Mother's Day and get back to real life. Whatever that is.